7 tsp baking powder ... yes seven! your cookie top into a dish of jimmies ... enjoy! NUMMY!!! Lucky boys and these cookies look delish! Oh Lori! These look so yummy! And pretty too! Thanks for including the recipe! I will have to give these a try! They are so pretty, Lori! I would love to try both to give you my very honest opinion!!! LOL!!!! YUM YUM YUM!!! My hubby runs a gourmet shop and we just received a sample of pure anise extract from a new company... I guess I'll just HAVE to make these cookies to try it out!!! How sweet!!! They look so yummy! Thanks for sharing the recipe. I'll have to give those a try. YUM!!!!!!!!! I think I might try these. Funny how your two boys had such different views on the cookies. Go figure! Thanks for sharing. Well, those are just so pretty with the soft blue sprinkles!! Nice. Oh my those look yummy ,just like the last ones you made! Thank you so very much for your prayers, encouragement, and support. yummy! those look delicious! Ironically it was my sons first day at vacation summer camp... he is 2.5... and I made a cake to celebrate... oh... Mothers... we know how to feed them, eh? 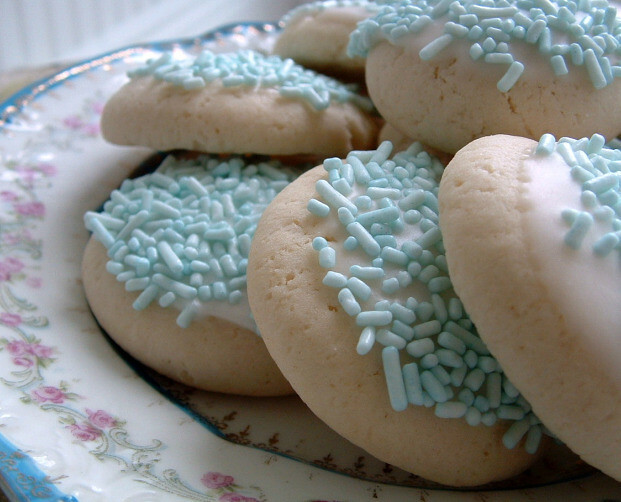 the cookies are beautiful- i love the soft blue color. thank you for sharing the recipe. OH YUM!!! Lori, you could always send me #2 son's cookies!!! These look sooo pretty! Oh these cookies are so yummy looking. I had forgotten about Jessica's tip for coloring the white jimmies. I'm going to have to try that - maybe a pretty shade of pink would be nice. Loved your boys comments on your last day of school treat! LOL! A lovely sounding and looking recipe. I probably would like the Anise version but I am quite sure that I wouldn't find the raspberry version "nasty"...;-)) Children can be so direct at times.. I just wanna sink my teeth into the computer screen! Lori, I'll have some of those 'nasty' cookies, mmm yummy. they are such pretty little cookies. So sweet! The last day of school. What fun possibilities lie before all of us? Love your cookies. And I saw her post about making our own colors and have been a coloring maniac ever since. It's just too much fun! Love your cookies, I am going to have to give them a try! They look fabulous, I'm sure they were delicious. It's so hard when you have more than one child to make everyone happy. It's like seeing a unicorn around my house. LOL!! I can't wait to try your recipe. What a great recipe! I love Anise in my cookies but maybe it's because of my Italian blood. Your cookies look delish and so does the new look of your blog, Lori. So sorry I haven't been by in awhile...but I certainly got a smile on my face when i saw your comment today. These are so VERY beautiful! I would stare at them for hours before devouring them! I love Anise too... so yummy! I wish I enjoyed baking. I am a great gourmet cook (toot-tooting my horn) but never got into baking. Maybe I should try it again. It's been years. always happy to come here. Lori, my first time to your blog, I love it! I am up late and so hungery! I could easily grab a cookie, but it would not taste like anything! and your blog is so fun! You even make cookies look beautiful. I love the colors too! I bet they are delicious besides. 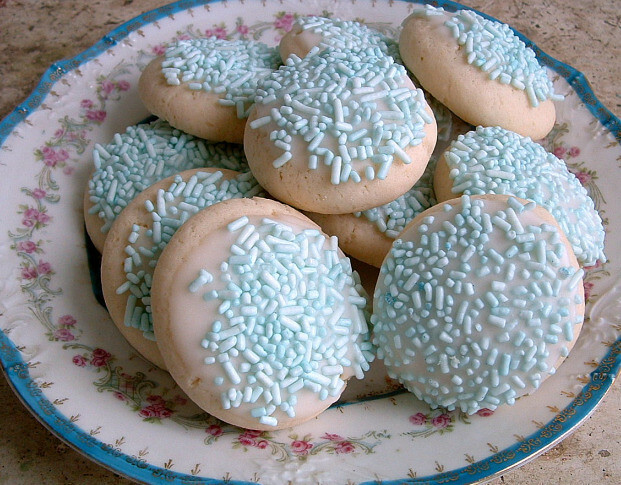 Thank you for the recipe, now where do you find light blue sprinkles? Oh, I am starving just looking at these. I am not an anise lover and I am sure I would pronounce the raspberry flavor"Just Wonderful!" What a nice mom you are! You can send me the what your son won't eat any time!!!! LOVELY ..I want those cookies..I can taste them right now..
well, you could spare yourself the calories from eating son # 2's share, and send them right to me! And I will save you! lol! truthfully though, Ive found that homemade cookies fall in the pizza catagory of my life, and are something that I can not control myself with very well.. in fact I think that just looking at and thinking about eating cookies puts a craving on me!! lol! have a great weekend Lori! Yumm on the cookies and that sparking mood of summer vacations, always enjoy your creative and inspirational posts. Mmmm I will come and help eat those yummy looking cookies! Can I just say YUMMMMMMMMM...good thing you are not in my neighborhood or I would be knocking on your door!!! Love the light blue sprikles on the cookies. They almost look to pretty to eat! I'm new to your blog and thought I'd leave a comment. I could eat his share..... I love rasberry!! Oh yummy! And so pretty to boot! Thanks for sharing... will be making these soon, for sure! Oh! Those cookies look so yummy, Lori!!! And pretty, too! Your new blog banner is lovely! The basket in that photo is the most perfect shade of aqua! Oh, those cookies look so delish! The look like little works of art, too! YUM! yep...his loss! Those are so cute! Love, love that soft blue frosting! I could so relate to *every* single word in the post below...to the weather ruining the flowers, the neglect, and looking for the joy there...sounds like home. Thanks for all of your beautiful encouraging words to me! Great cookie recipe! Will try it soon. Lori, I don't cook but this recipe looks so good that I really want to try it. I am sure your boys adore you! I buy stuff from Bake it Pretty (cupcake liners) all the time for my faux cupcakes.